Since 1995, Clean Sweep Chimney Sweep has provided chimney cleaning, stove installation, fireplace inspection, flue relining and other crucial services to residential, commercial and industrial customers throughout Columbia, South Carolina, and the greater surrounding area. We use only quality materials and heat-resistant technologies for your safety. Misconceptions about fireplaces and vent systems are all too common, and can lead to dangerous neglect or even deadly mistakes. Most people don’t realize that the majority of chimney damage is caused by water rather than fire, which weakens the chimney’s structure and increases the risk for deadly fires. Similarly, most people don’t know that home dryer vents become clogged over time and cause more devastating house fires than chimneys. 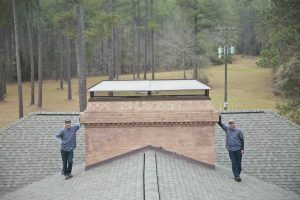 That’s why, as the leading chimney sweep in Columbia, SC, we provide comprehensive flue cleaning services, chimney repair, safety inspections, ventilation and air duct cleaning, stove insert conversion and more to ensure your home or business is structurally sound and safe from fire dangers and poor air quality alike. We are your Certified Chimney Sweep (CSIA). We are proud members of the National Chimney Sweep Guild, the South Carolina Chimney Sweep Guild and the North Carolina Chimney Sweep Association. We are a certified and factory-trained dealer of HeatShield products, and an authorized dealer of Buck wood stoves. We provide service within a 50-mile radius of Columbia, SC. "So friendly and did great work! " April 10, 2018 Becki A. "They did a great job fitting in a fireplace and chimney inspection for a client within our allowed due diligence period, and also were able ..."
April 10, 2018 Gregory B. "Had a chimney fire back in April last year which damaged entire fireplace and chimney all the way through the roof. Had to rip out brick, wa..."
February 7, 2018 Joseph O. "These guys are as good as it gets. I remodel houses for a living and consistently need work done to fireplaces on houses I buy and sell. If ..."
"Art Rollins and Rob were completely awesome with the installation of an insert in our home. This was a huge decision for us as we loved our..."